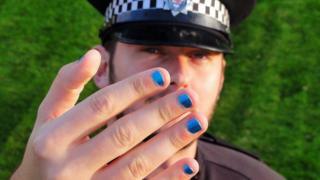 A police force was inundated with complaints after officers painted their nails to highlight modern slavery issues. Avon and Somerset Police officers tweeted the photos on Anti-Slavery Day to highlight issues in nail bars. Some social media users described the move as an "epic fail" and a waste of the force's time and money. But Ch Insp Mark Edgington said the campaign "worked as it's got people talking". Officers were endorsing the "Let's Nail It campaign", which was launched on Anti-Slavery Day last year by the charity Unseen, to highlight how people trafficked to the UK often end up working in nail bars. The charity is part of the anti-slavery partnership that Ch Insp Edgington chairs in the West. Police later posted a response urging people who found reactions to their campaign offensive to report the messages to the force. Officers, including the assistant chief constable, took part in the campaign. Ch Insp Edgington, said: "In terms of being out and visible on the streets, it raises the question... people come up and ask why you've painted your nails and it starts the conversation." On its website the force said that over the past 12 months it had dealt with 60 investigations of modern slavery and had seen a significant increase in modern slavery-related intelligence which had resulted in visits to premises suspected of modern slavery. But Twitter users were unimpressed, with one saying "I'm offended that the police force is so out of touch with reality". Ch Insp Edgington, said: "Some people will disagree with the campaign, which is their prerogative, but the campaign has worked as it's got people talking. "It's part of a much wider range of measures but we do need intelligence and information from the public and raising awareness is key." Unseen began its campaign following a report from the UK's Anti-Slavery Commissioner into trafficking routes to the UK, which highlighted the problem of human trafficking victims ending up in places such as nail bars. It prompted celebrities and nail salons to join the campaign, which worked to raise awareness of the problem and help to stop slavery in outlets.